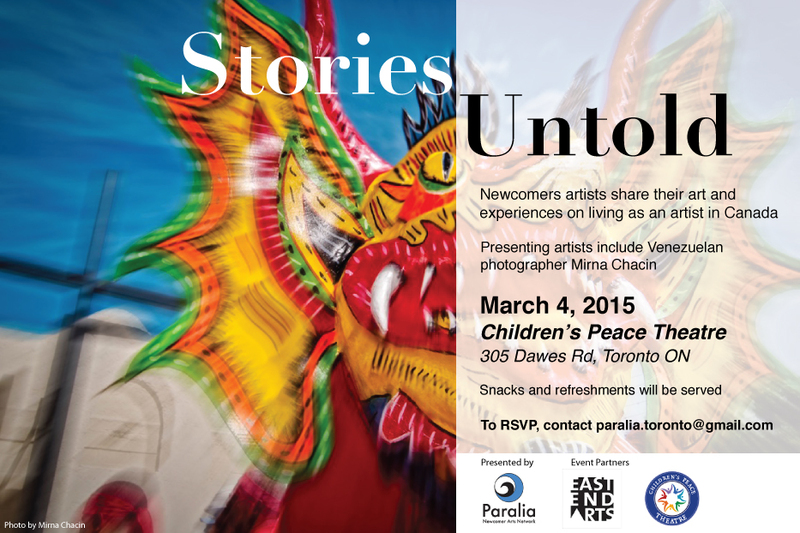 Paralia, in partnership with East End Arts and Children’s Peace Theatre, presents the event “Stories Untold” which will feature two experienced artists who will share their stories and challenges while trying to establish as an artist in Canada. These artists will also have the opportunity to introduce their works. 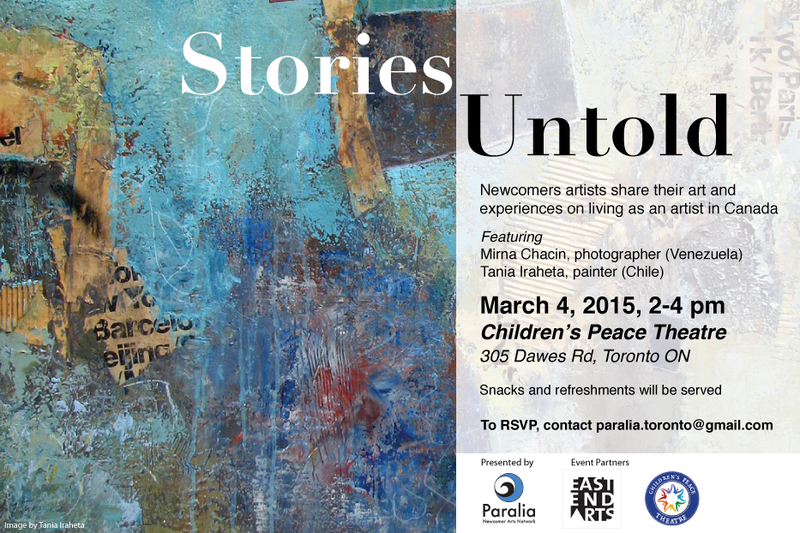 Come meet Toronto’s local artists from all over the world! The event will be followed by an hour mix and mingle over hot cocoa, coffee, and snacks. Take the opportunity to ask as many questions as you want and do some networking. The Venezuelan artist Mirna Chacín will be one of the artists featured in this event. Mirna discovered her passion for photography as a means of artistic expression when she was an architecture student. In 1988, her debut in Fine Arts earned her the first prize in photography in the Visual Arts Biennale of Maracaibo, Venezuela. After many solo exhibitions, she has recently participated in collective art exhibitions all over the world. Shortly before immigrating to Canada in 2011, Universidad del Zulia (LUZ) awarded Mirna The Francisco Hung Bracho Medal for her artistic achievements in Venezuela. She is currently, working to develop her new media art project: Dancing with the Devils and on the curatorial phase of the series: Children of Dawn and Toronto Summer Daydreams. Mirna lives in Toronto and is an active member of The Neighbourhood Arts Network and G44 Center for the Contemporary Photography. Tania Iraheta is a Chilean visual artist and arts teacher who has been practicing art for about fifteen years. Although she has been more focused on teaching, Tania has been part of many collective exhibitions since 2004. She holds a diploma in Graphic Design from George Brown College. In 2010 she was awarded an Access and Career Development Grant by the Ontario ArtsCouncil which allowed her to attend the Toronto School of Art but she is mainly self taught. She is the art instructor for Pinceles Latinos which is an art studio located in North York. Pinceles Latinos (Latin Brushes) offers visual arts workshops for the Latin American community as part of Casa Maiz Cultural Centre. Through these workshops that Tania conducts during each year at Casa Maiz as well as other organizations, she has been able to demonstrate her tremendous desire to have a positive effect on the lives of people in the community. How can you get here? Take the 23 bus at Main Street Subway Station and get off at the “Park Vista ” stop. Walk into the park and follow the path for a couple of minutes. Very interesting opportunity for newcomer artists! The first deadline is March 8th, 2015. Find below all the information posted by the Toronto Arts Foundation on their website. TORONTO, February 5, 2015 – Toronto Arts Foundation is pleased to announce its partnership with RBC Foundation to build on the potential of newcomer artists and break down the barriers they face when it comes to arts access. Toronto Arts Foundation will launch RBC Newcomer Artist Spotlight, designed to connect and inspire newcomer artists who are Toronto’s new generation of cultural leaders and innovators. As part of their commitment to strengthening the arts in Toronto, RBC Foundation will donate $50,000 to Toronto Arts Foundation. Toronto Arts Foundation is delighted to announce the Neighbourhood Arts Network RBC Arts Access Fund: micro awards of up to $1,500 for newcomer artists looking to jump-start their community-engaged arts projects. The awards will be administered by the Foundation’s Neighbourhood Arts Network. These awards will be tied to actual project needs, ranging from art supplies to space rental for an event. The first deadline is March 8th, 2015. Applications for the RBC Arts Access Fund can be found at http://www.neighbourhoodartsnetwork.org/. From March to August 2015, a series of four events called Let’s Talk Art will bring together acclaimed professional artists, arts leaders, funders and creative business experts to help lead a range of professional development workshops for newcomer artists. Facilitated by the Neighbourhood Arts Network, each round table workshop session will give newcomer artists access to the gatekeepers of the Toronto arts sector, an opportunity to increase their capacity and understand how to navigate the arts in Toronto. 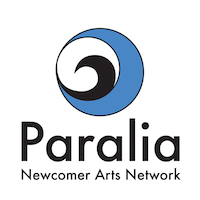 Registration information can be found at http://www.neighbourhoodartsnetwork.org/news/lets-talk-art-professional-development-series-newcomer-artists.